Evy enjoyed the three day weekend in celebration of Labor Day. Her cousins from New York came into town and the schedule was packed with fun. Events included dinner and cake and then a family reunion (complete with another pinata). After that it was time for a return trip to Kennywood. 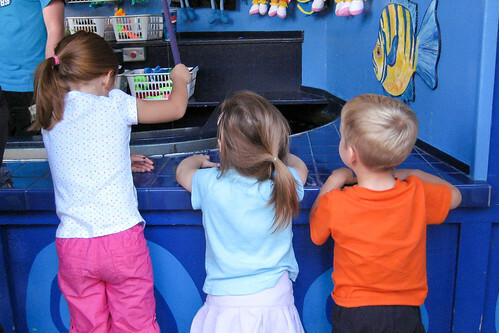 All three cousins won a prize at the fish pond. 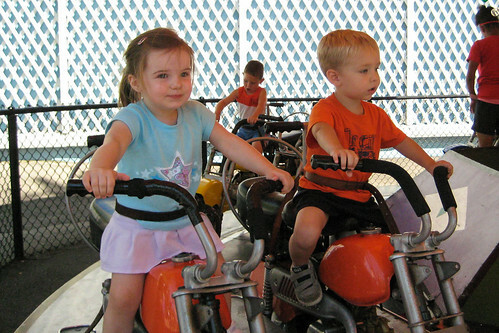 Evy and Ben cruised on the motorcycles (and helicopters and spaceships and planes and elephants). We wrapped up the weekend with a Labor Day picnic. 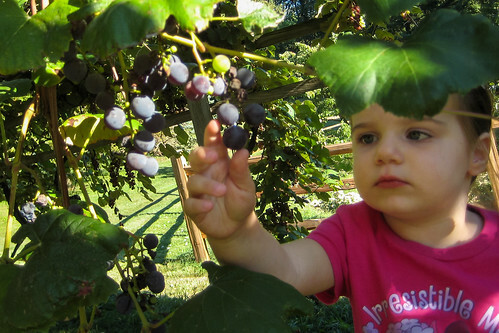 After feeding the ducks and inspecting the tractors, Evy had a chance to check the progress of the grapes in the arbor. She classified them as "good." What a fun time with the cousins! I think the fish pond sounds like a great place. And another pinata? Was there candy in it when it broke? I bet those grapes have seeds in them. Be careful! Your eyes look like you were not feeling up to par. I am glad you are feeling better now. It is not fun to be sick. I am excited you had such a fun weekend. Grandma C.